Overall Rating: A must have for any Albator/Harlock modeler fan. Looking like a cross between the Fock-Wulf 190 and the F4U Corsair from the "Baa Baa, Black Sheep" series ("Les Têtes Brûlées" in French), this small fighter from the Harlock/Albator animé series, with a look of a rocket plane from the fifties, cleaves, not the air, but the space in pursuit of Mazones and Illumidas ships. A model of this vessel has only been produced at the time of original series (end of seventies) by Takara and only for the Japanese market. 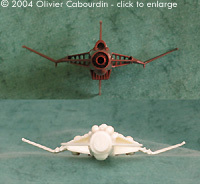 It was a mini kit, like the Bandai mini mechanics from StarBlazers/Space Cruiser Yamato series. ^ Front comparison of Takara and Alex kits. Image: Comparison of the Takara kit and the main body part of the 2nd edition kit. ^ Comparison of the 1st and 2nd edition main body part. 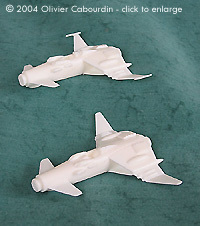 ^ Comparison of second engine pods between the Takara, Alex 1st (with fin root) and 2nd editions. 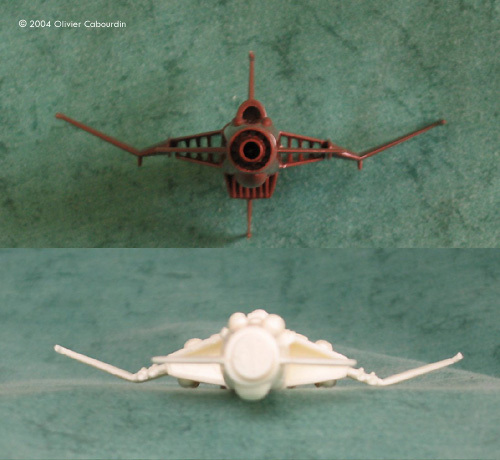 Image: Comparison of cockpit canopies between the Takara, Alex 1st (with fin root) and 2nd editions. It was also included by Takara with Ramis/Daiba Dagger fighter in their Arcadia 1/1100 scale model kit, at the same time and certainly produced to even less number. Better say that it is very difficult to get one of this kit. Alex Creation now provides us a second edition of his improved recast of the Takara model. A review of the first edition of the Spacewolf kit can be found here, so the current review will focus on the upgrades of the second edition. 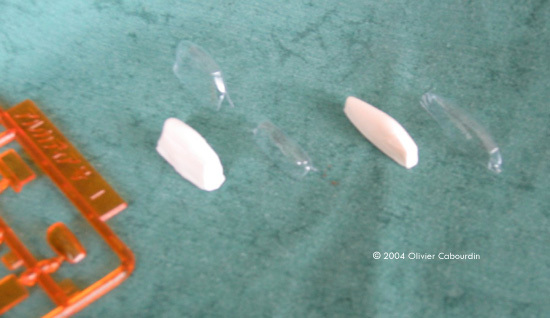 The resin is the white odorless one, of a better quality than on the first edition. 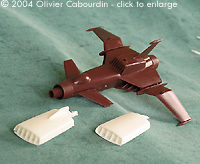 The molding quality has increased since Alex's first kit (the Cosmowing, also from Harlock animé), and only few bubbles (<5) of very little size (<0.1mm) were found. The first edition had a casting problem in the rear exhaust grids, which were air traps (that was the main complaint of this edition); this have been solved for the second edition, as they are now bubbles free. The scale is stated at 1/100, but my feeling is that it is certainly closer to 1/144, which is reinforced by the size of the pilot itself. The problem is that the length of the "real thing" is unknown, so it is difficult to give a final word here. Anyway, when placed alongside some Macross fighters in 1/144 and 1/100 scales, the Spacewolf looks better in the 1/144th world. This part is well detailed and mostly clean (only 3 tiny bubbles found). The milling joint between the front wings and the main wings will need some attention in sanding. A little sanding will also be necessary between the canopy and the aft of the main body as this is not completely smooth here. The rear exhaust grids present no bubbles and are perfectly cast. Same thing on different tiny details here and there that are now bubbles free. Curiously, the pylon at the end of the wings have been separated from the wings themselves. On the two first edition Spacewolf kits I own they were part of the wings and present no problems, so I supposed it is the answer to pouring troubles in the first edition and decreasing the number of rejected castings. The result is that you need to put some more work here. The two forward guns (the teardrop shapes in front of the cockpit) have also been modified. The guns muzzles themself have been removed - you have to supply some 1mm diameter tubes if you want to re-add this detail ! Easy to do, but annoying. The front of the fuselage is lengthened of about 2mm. The production drawings showed differences between themselves here, so you have to remove these 2mm for a Spacewolf from Harlock 1978 series, or leave it as is for the 1984 serie. This is an improvement, as it is quicker and easier to remove than to add a 2mm thick plastic card like in the first edition. I suggest to use a hobby saw, like Hasegawa's ones, instead of a nipper, for this surgery. The aft end of the canopy is also different; it is now part of the clear part. I cannot say anything about the pertinence of this modification as I still have not build the first edition kits. But it seems to give more depth to the cockpit, and so a better rendering. Two little details disappeared in the process and have been replaced by decals. This part has been heavily modified. The air intake presents 5 struts instead of 4 for the first edition. 5 is more accurate, but 4 is the logical way, because the underside fin retracts at the center of the intake when the plane is landing, so where a strut takes place?! The root of the fin has been removed so the underside fin is now in one part, which is far better to my opinion (less work). Some recessed lines have been added which don't seem to be accurate ... but logical, for the same reason as above. Builing the plane in the landed version will require some surgery to this pod. As previously mentioned, the underside fin is now in one part. A side result is that base will need some adjustments (a little sanding) to get a perfect fit with the secondary engine pod if you build the plane in flight. The underside and upper side fins are wider than in the first edition, and the result is more accurate (I missed this in the previous review). The tail exhaust thruster is improved, thinner now and the inner recessed line are more accurate. Two noses (air intake) are provided in the kit. You will have to choose which one to use. The shortest one is an improved version of the first edition (the intake itself is deeper) while the longest one is thinner and has a better finish. The best solution may be to take the longest and to sand the extremity of about 2mm to get the most acurate one. The fuel pods have been redetailed and the casting is improved. Only some minor sanding on the milling joint will be needed here. The landing gear and the pilot were not part of the first edition kit, at first. A few months later, Alexandre provided them to any customer who asked for them. The ones provided in this second edition are the same, and need some cleaning. As the kit is not heavy, the landing gear will hold it without troubles, but handle with care, as they will certainly be fragile. Due to the modification occured on the main body, this part is lengthened to cover the aft of the cockpit. The aft frame of the canopy is not precisely delineated, so you will have to pay attention to make a symetrical masking. Two canopies were included in the first edition (in case you messed one up), but this is no longer the case. This is certainly the best improvement of the kit. At first black and white, and a little pixelized, they are now coming for JBOT, and are full of colors and nicely sharp. 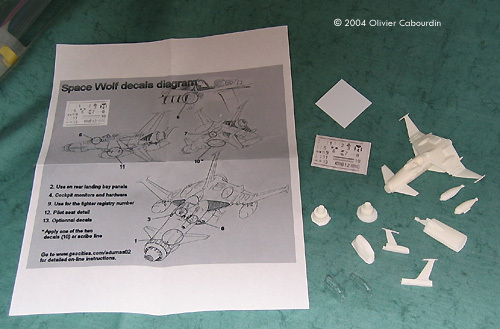 The sheet included the instrument panels, the pilot seat and usual markings and some beautiful bonus decals: wolf's mouth and eyes, wolf head baying in front of a moon crescent, dead head and bones (Harlock's corsair banner), which allow you to do some custom decorations for this plane (a beautiful exemple is given in the instructions). While the reasons of some modifications on this second edition are not clear to me, most of them are real upgrades. When coupled with an improved casting process, the result is a superior kit, and well detailed for that scale and size. And the decals sheet is a real fine addition ! This kit is not recommended for a beginner modeler, but it can be the first resin kit of a modeler which already have few injected model kits behind him. Anyway, a must have for any Albator/Harlock modeler fan. Many thanks to Alexandre Dumas for providing the review sample. Manufacturers and retailers, interested in getting your wares reviewed and publicized on a site averaging 3500+ readers a day? Contact us! This page copyright © 2004 Starship Modeler. First posted on 15 January 2004.